Ruby Rose continues to come into her own as a capable leader. This season has shown her taking charge in several situations and making decisive decisions. She got the truth from Ozpin about Salem after asking Jinn, the Spirit of the Relic of Knowledge, to reveal it. 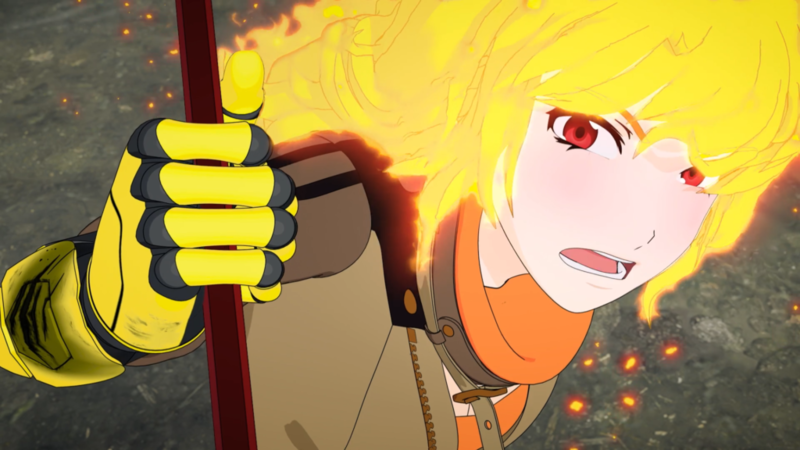 She took charge after seeing Qrow falling back into the bottle and losing faith in Ozpin once it became apparent of his distrust in people, and even more so while they were staying with Jaune’s sister in Argus. Ruby took care of the Apathy Grimm and was the only one seemingly unaffected by the creature’s severe despair inducing capabilities. Now she has taken charge of Jaune’s plan to get to Atlas, issuing orders to her teammates with diligence. She even manages to coordinate a counterstrike when they are attacked by Caroline Cordovin who is piloting a giant robot. Ruby shows true bravery by trying to negotiate with Caroline, who has seemed to have lost her senses. 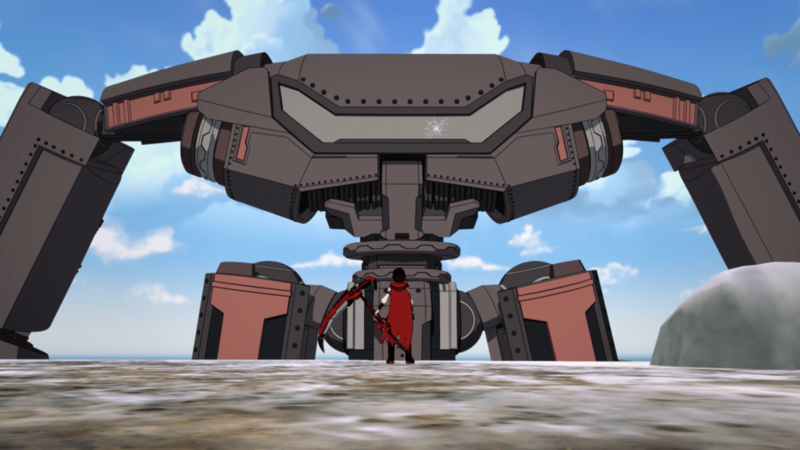 She walks up to the giant mech and stands her ground. These points illustrate just how much Ruby has grown since we were first introduced to her as a cookie-loving, weapon obsessed, sometimes absent-minded young lady. Even her uncle Qrow has noticed the growth in his niece. Dealing with the past can be tough especially when that past comes back to haunt you – and potentially kill you. Blake has been dealing with her past life as a member of the White Fang since she left years ago. Where she tries to let go of the past, Adam Taurus tries to pull her back in. She has stated before that her “Shadow” Semblance is a manifestation of her fear and running away. Now the time has come for her to stop running. To help build relations between humans and faunus, Blake must stop the person she once fought beside for the greater good even if she has to kill him. This decision is difficult for Blake since she and Adam were more then just comrades in arms at one time and she still may harbor feelings for him. Adam is steadfast in killing Blake to keep get from the rest of the world. So the choice was made for her. The showdown with Adam not only served for Blake to sever ties with Adam but mend the ties of friendship with Yang. 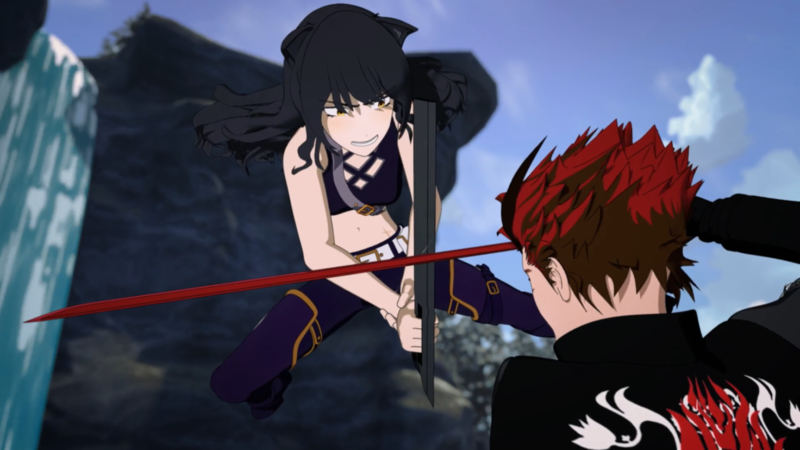 Yang’s dynamic entry into the fray showed that she has fully forgiven Blake, deciding to fight with her for both of their sakes. Fans may want their ‘Bumblebee’ couple but I feel that this relationship may not go beyond friends. If anything, the experience had brought them closer. Anyone else think that Caroline Cordovin is a few cards short of a full deck. Clearly, she is dedicated to her job, but she may be a little too overzealous about it. Ever since they arrived in Argus, she has done nothing but give Ruby and her friends a hard time. And now she is ready to use a giant robot to blow our heroes away. Caroline’s pride in Atlas is overshadowed by her overconfidence which leads to her underestimating her opponents. It is apparent that her greatest strength is also her greatest weakness as she fails to notice an alert from Argus base warning her of a Grimm attack. As Ruby said to Caroline, they are fighting on the same side. Question is will Caroline swallow her pride.